Doctors and nurses fighting Ebola in West Africa are working 14-hour days, seven days a week, wearing head-to-toe gear in the heat of muddy clinics. Agonizing death is the norm for their patients. The hellish conditions aren't the only problem: health workers struggle to convince patients they're trying to help them, not hurt them. 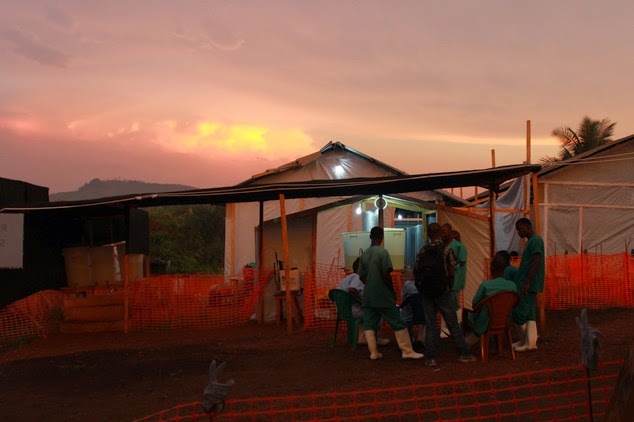 Rumors are rife that Western aid workers are importing Ebola, stealing bodies or even deliberately infecting patients. Winning trust is made harder by a full suit of hood, goggles, mask and gown that hides their faces. "You want to say so much... because they're in so much pain," said nurse Monia Sayah, of Doctors Without Borders. "They suffer so much, but they can only see your eyes." The outbreak has hit three of the world's poorest countries, where health systems there were already woefully understaffed and ill-equipped. In Liberia, there is only one doctor for every 100,000 people, while in Sierra Leone there are two, according to the World Health Organization; there were no statistics available for Guinea. The figure is 245 for the U.S. Emotional distress conspires with exhaustion and dehydration, but doctors say it's hard to stop working. "When the need is so great, you can't justify not being there for a day or going home earlier," said Robert Fowler, who recently worked in Guinea and Sierra Leone. The critical care doctor at Sunnybrook Hospital in Toronto, Canada — now on sabbatical with the World Health Organization — said that the barrier of the protective suit is big but not insurmountable. "There was a young girl, about six, who came in late in the illness who was bleeding from her bowels, very dehydrated and delirious," he said. Ebola wiped out her immediate family — so she was all alone. "She was very frightened and very reluctant to engage, and just wanted to push people away," he said. Fowler spent days trying to help her, bringing her things she wanted like Fanta soda. "She eventually developed this sense that this person in the suit who's a bit scary is trying to help me." One day he brought the girl her favorite dish: cucumbers and lime. "She chowed down," he said — a sign that she was on the mend. Fowler said the girl was close to being discharged by the time he left Guinea. The girl is the exception rather than the rule. Death is the fate of more than half of the West Africans infected in the Ebola outbreak. "With the mortality rate being what it is," Fowler said, "you know every day there will be a couple of patients on your ward who didn't make it through the night." Kent Brantly — an American who fell sick from Ebola last month treating patients — echoed Fowler in speaking of the moral weight of the struggle. "I held the hands of countless individuals as this terrible disease took their lives away from them," Brantly said in a statement this month. "I witnessed the horror firsthand and I can still remember every face and name." Brantly is now being treated in an Atlanta hospital. His condition is improving. Sayah said that heat makes it impossible to work continuously for more than an hour. It means tasks have to be completed with near-military precision. Her makeshift Ebola tent hospital in Gueckedou, southern Guinea, was converted from an earlier clinic set up by Doctors Without Borders to handle cholera epidemics. "If you have to do patients' blood work and IVs, you focus only on this, and you know your other team members will get the patients food and drink," she said. The tough odds don't make it easier to see a patient die. "There was a very strong, resilient, gentleman, who always made an effort to sit up and open his eyes and tell us how grateful he was that we were here," said Sahah. She said the man appeared to be improving but suddenly deteriorated. She was forced to take a break after getting dehydrated. When she returned about 40 minutes later, he was dead. "When a patient dies like that, it's very upsetting because we're their last hope." Cokie van der Velde, a sanitation specialist for Doctors Without Borders in Guinea and Liberia, cleaned Ebola wards — washing floors, emptying buckets and collecting bodies. One day, she came across a harrowing sight. "I walked into a room with four bodies and they'd all died in the most grotesque positions, with a lot of blood and feces everywhere," she said. "During the night, one man had crawled to the door and the other people who died, they seemed to have fallen off their beds and were bent backwards." Normally, the Briton spends her days in Yorkshire, England, tending to her garden and looking after her grandchildren. Van der Velde has worked on two previous Ebola outbreaks and says she does it because she believes in justice and equality. She said the need for medical care is overwhelming in this outbreak because of the heavy toll Ebola has taken on health workers. Many of those sickened and killed have been doctors and nurses. That has sparked fear among local staffers and led to strikes and resignations. "I can't blame them," van Der Velde said. "They're scared."